This was on eBay, it is a 1967 model. To quote the vendor "This is not the usual Mk1 GT6 for sale where by it is either looking tired and rusty or restored to look like a GT6 but with after market parts. resulting in nothing left on the car from 1967. 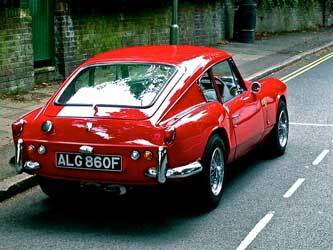 This is a genuine 1967 GT6 with plenty of history. Obviously parts have been replaced when worn and it has had changes over the years not least from its original colour of white to signal red in the 1990's. When you sit in the car however. you feel like you are driving a piece of history. All the dials and dashboard have a lovely patina. they are all original including the original headlining. sun visors window latches etc. The seats and seatbelts too are original to the car but the seats have been recovered and the seatbelt webbing has been changed. The carpets have been retrimmed along with the door cards and make for an absolutely beautiful place to sit and take in the engine note this car produces. The car really does need for nothing and has enjoyed very loving owners during its lifetime. When I bought the car it was in need of a bit of attention to the floors and the paint was a little tired in places. In 2013 I had the floors and boot replaced and all areas of the body addressed before being sprayed in ICI signal red. The car came back to me in 2014 and since then it has had all the mechanical work done to it to make it a truly fabulous car to drive. The car comes with plenty of history and obviously i can answer any questions of recent work. I took the car around the Cotswolds in the summer and it didn't miss a beat. It had the carbs stripped and electronic ignition added early in the year (not to mention new discs and pads) and and really does drive great. No further restoration will be needed on this vehicle - everything has been taken care of. This car is super reliable and will drive anywhere - from the local Tesco to a car show the other side of the country. I do not believe there is a nicer original (to a point) GT6 out there and this is truly a beautiful car. Everywhere you drive people want to talk to you or take pictures as no one knows what it is. but collectively they all agree it's one of the prettiest cars ever made". To quote the vendor, again. 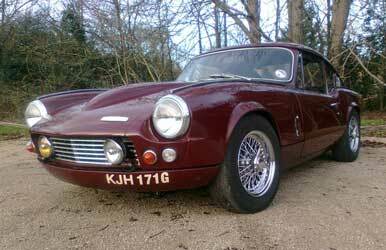 "Triumph GT 6 mark 2, 2.6 litre PI. This is a very modified and rebuilt GT6. It has been debumpered and metal lip arches welded in to accommodate the 5 & 1/2 inch dished centre laced 70 spoke wire wheels. Ignoring a dealer I am the second owner of the car which has covered less than 70,000 miles total. This car has a 2.6 litre fuel injected engine. It has a big valve fully ported stage four head, sprint cam, eight bolt flywheel, polished lightened cracked tested sized rods with ARP bolts. The engine is also fully balanced with a lightened GT 6 fly wheel. It has a sixteen row oil cooler, electronic ignition and competition leads. The radiator has a custom built high density core and an electric fan fitted. The gear box is a fully rebuilt J type dolomite sprint unit with a cut down first motion shaft. The prop shaft is a one off thick wall tubed Jaguar UJ large spline joint up rated item. The differential has a brand new original Leyland 3.27 crown wheel and pinion using a late type machine down 3.63 carrier. The drive shafts are CV jointed with MGF hubs. The suspension is fully poly bushed, with lowered stiffened adjustable shocks. The brakes have drilled disks with four pot calibres. The differential, proper shaft, gearbox and engine have all recently been rebuilt and run in. It has not been used on any track days since". "This prime 1973 example has led a charmed life receiving not one, but two comprehensive restorations in its lifetime. Its massive history file includes a Heritage Certificate which shows that it was originally white with black trim and was completed on 31st August 1973 and dispatched from the factory on 1st October of that year. 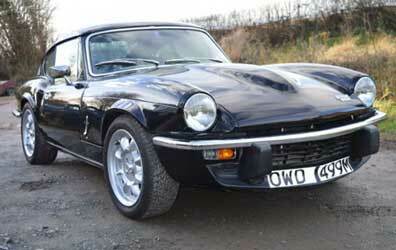 It was fitted with an overdrive and Sundym glass. The original Passport to Service was first stamped by the supplying dealer, Millar Brothers of Leamington Spa, and contains 5-stamps in total. A letter from a previous owner states that in the 1980s (its first restoration), it was completely stripped and fitted with a galvanized chassis (although it is unclear whether this was a new one or the old one sent away for treatment), a completely new bodyshell and a 2.5-litre engine from a Triumph saloon. No fewer than 29 old MOTs show that it has covered just 26,000 miles since 1980. By the mid '90s its then owner decided to give it another full restoration to get it to the condition that he desired and embarked on a full strip and repaint as well as a whole host of upgrades, bills on file adding up to over £30,000! He fitted wider wheel arches to accommodate the 6 1/2J Minilite wheels and Goodyear NCT tyres. The galvanized chassis was, of course, found to be excellent and was further wax injected and fitted with Spax adjustable shock absorbers, uprated springs and anti-roll bars. The rubber bushes were replaced with modern nylon and the brakes were upgraded with 4-pot calipers on the front with vented discs and a servo. Goodrich hoses and stainless fuel lines were also fitted. The 2.5-litre engine was stripped and fitted with a gas-flowed head, TriumphTune camshaft, vernier timing gears and a lightened flywheel. A custom fuel rail was made and fitted with modern injectors (BMW), all mated to an Emerald ECU to control fuel flow. A stainless manifold and twin-exhaust system makes the car sound as one would expect, a Kenlowe fan keeps it nice and cool and a Hi-torque starter makes for confident starting. It has a D-type gearbox with overdrive and an uprated clutch and a completely new wiring loom was fitted during the rebuild. Inside there are extra gauges, leather upholstery and lashings of walnut veneer. It was then professionally painted in black which remains in excellent condition with just a few minor blemishes. Purchased by the vendor in 2005 from The Old Coach House Motor Company, it has been thoroughly loved and polished ever since. It has been serviced religiously every year by local garage, Brian Watkins Car Services, who have always queried why the vendor is getting it done as it has only ever covered a handful of miles between MOT certificates, its current MOT expiring on 27th July 2015. The records show that it had covered 23,000 miles on its original engine and a further 29,000 with the larger 2.5-litre unit, making total of 52,000 miles from new. It is being sold with an original sales brochure, a car cover and 'car-bra' which covers the front to avoid stone chips. It even has a complete original tool kit and a secondary, more comprehensive kit which has been assembled by the owner over the last few years."